DataMites™ Data Science Online training is a comprehensive learning path that enables you to master the core concepts of Data Science and helps you to specialize in the essential skill set required to become a Data Scientist. This Data Science Online Course allows you to experience flexible learning and also to work at your own pace. 9. Data Science business concepts that helps the aspirants in specialising the area. DataMites™ Data Science Online Course is designed specifically to meet the needs of working professionals who are interested in acquiring new skills without compromising their current job. The course is well structured in three phases and allows you to walk through each phase with full confidence. It is a perfect opportunity to harness your knowledge in this new booming domain. Gain advanced competencies and confidently make strategic data-driven decisions after completing this DataMites™ Data Science Online Course. Pre-course study helps you to develop your knowledge on the basics of Data Science and Machine Learning. It is a self-study phase that needs to be completed before entering to phase 2 module. Phase 1 includes high-quality videos, E-books covering the syllabus of Basic Python Language, Basic Mathematics for Data Science, Statistics essentials for Data Science, Beginners guide to Machine Learning (E-book) and Practice Materials. Furthermore, it facilitates the candidates to practice scripts at a cloud lab conveniently. This is the most essential part of the training that comes with fulltime intensive online training sessions. This phase covers the next higher level syllabus of Python/R Programming, Statistics, Machine Learning Associate and expert. This is a dedicated part for candidates to make them market ready after the series of intensive coaching and learning. It covers 4-month Project Mentoring, exposure to 5+ detailed Industry related projects, revision sessions, access to an extensive collection of interview questions, resume support, mock interview sessions, job updates and experience certificate. Why should you consider Data Science? Currently, more than 90,000 Data Science job openings are being advertised in India leading to a sharp increase in demand for highly-skilled Data Science professionals. The average salary of a Data Scientist is $113,436, according to Glassdoor. Businesses who have started analyzing their data will see a benefit of $430 billion in productivity by the year 2020, over their competitors not analyzing their data. Data Science helps businesses to make informed decisions by examining their large amount of hidden data. DataMites™ Data Science Online training helps aspiring candidates to master the Data Science concepts and the techniques that are vital for this job role. This learning consists of all the essential areas such as Python, Statistics, Machine Learning, Time series foundation, Model deployment, Deep Learning, Tableau and Data Science business concepts that a Data scientists need to be specialized. It allows them to go through a structured online learning phase and master the concepts at your own pace. What are the objectives of DataMites™ Data Science Online training? Gain a thorough knowledge of Data Science concepts that includes Statistics, Machine Learning, Tableau, Deep Learning, Time series foundation and Data Science business concepts. Comprehensive knowledge on Machine Learning as it covers both Associate and Expert courses. Ability to perform Model Deployment independently. Exposure to real-life case scenarios with hands-on 5+ detailed Industry related projects. 4-month Project Mentoring with unlimited Projects from diverse industries. Exposure to Large collection of interview questions and many mock interview sessions. What are the essential skills that you will acquire after completing DataMites™ Data Science Online training? Gain a better knowledge of the entire Data Science project workflow. In-depth knowledge of Data Mining, Data forecasting, and Data Visualization. 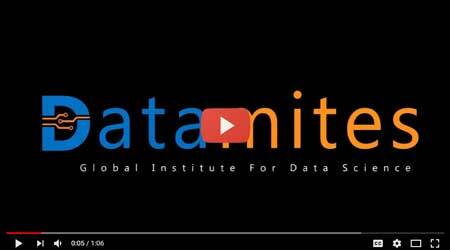 Why should you take up DataMites™ Data Science Online Course? Exposure to different industry related projects. Project managers who want to manage Data Science project. Business analytics who are interested in enhancing their Machine Learning knowledge. What is the prerequisite of DataMites™ Data Science Online training? DataMites™ Data Science Online training doesn't require any prerequisites. However, a basic understanding of Data Science concepts and tools used would definitely be beneficial. Module 1: What is Time Series?